Click here to view the recorded webinar (or paste the link http://youtu.be/WXKcDUrUZwc into your browser). Fire severity is the combined function of the disturbance intensity and the relative susceptibility of ecosystem elements such as vegetation and soils. Indicators of disturbance severity, such as needle scorch and soil coloration, are often ephemeral, requiring measurements immediately following the fire. 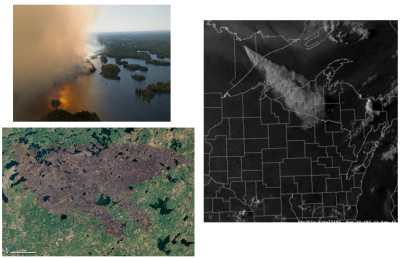 The Pagami Creek Fire of northern Minnesota represented a unique research opportunity because of highly-detailed information on forest conditions available prior to the burn due, following nearly a decade of remote sensing activities in the region. An NSF RAPID Grant enabled Dr. Sturtevant's team to access the fire within a month of the primary burn activity. The webinar will report on the initial results of the fire severity assessment, including overstory and understory fire severity, remotely-sensed estimates of fire severity, and impacts to soil carbon, nitrogen, and mercury. It will also review the degree to which indicators of fire severity degraded both after a winter season and a subsequent growing season. The study provides unique insights into the ecological and ecosystem impacts of a large and severe wildfire within a subboreal forest system. Read more about Dr. Sturtevant's work with spatial analyses, landscape-scale field research, and forest landscape disturbance and succession modeling and the USFS Northern Research Station.